2" x 150' rolls of (V92) 5-7 year rated DOT conspicuity tape and (V82) 10 year rated tape available in the popular 7 inch white by 11 inch red pattern, a 6" red by 6" white pattern or in solid white. We also carry the (V52) 7/11 and solid white rolls with the "diamond plate pattern". All rolls exceed DOT and FHWA requirements. Also, Reflexite tapes are manufactured as a single layer and WILL NOT delaminate like other tapes. Easy to apply. Simply peel the backing off and apply to a clean surface. Click here to go to our DOT Wholesale Pricing Page. Make your selection above using the drop down menu. 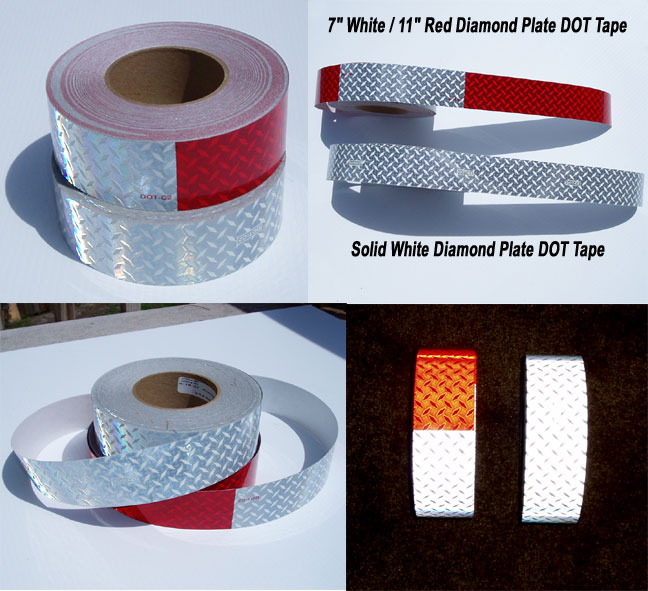 For more DOT tape choices click here to go to our other online store. Choose your roll using the drop down menu below. All rolls on this page are 2" x 150'.